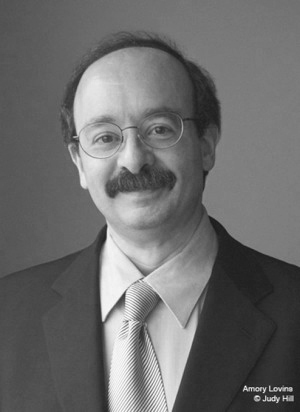 Recovering physicist Dr. Amory Lovins, FRSA, is cofounder, Chairman and Chief Scientist of Rocky Mountain Institute (www.rmi.org). He is also energy advisor to major firms and governments in 50+ countries for 40+ years; author of 31 books and over 450 papers; and recipient of the Blue Planet, Volvo, Zayed, Onassis, Nissan, Shingo, and Mitchell Prizes, MacArthur and Ashoka Fellowships, 11 honorary doctorates, and the Heinz, Lindbergh, Right Livelihood, [United States] National Design, and World Technology Awards. A Harvard and Oxford dropout, former Oxford don, honorary US architect, and Swedish engineering academician, he has taught at ten universities, most recently Stanford and the [United States] Naval Postgraduate School. In 2009, Time Magazine named him one of the worldâ€™s 100 most influential people, and Foreign Policy, one of the 100 top global thinkers. His latest books include Small Is Profitable (2009, www.smallisprofitable.org), Winning the Oil Endgame (2004, www.oilendgame.com), The Essential Amory Lovins (2011), and Reinventing Fire (2011, www.reinventingfire.com).